The NTHA has been serving the North Toronto neighbourhood and surrounding communities since 1965. Our mission is to provide a safe and fun environment to learn, play and compete in youth hockey. The Green Wall serves as a lasting tribute to those exceptional individuals who played the game or helped to deliver the programs here at NT. The Green Wall is conveniently located beside the banquet room entrance on the way to the snack bar. Come by to have a look next time you're at the arena. 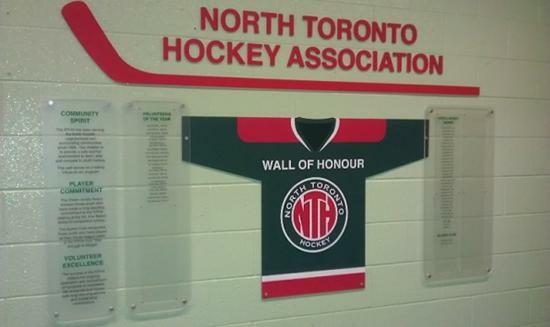 If you would like to nominate a candidate for the Green Jersey Award, Alumni Club or Volunteer of the Year, or if you have any questions regarding The Green Wall, please email greenwall@nthockey.ca. Click the tabs below to view past winners of these prestigious awards.